The Harvest-Monrovia Water & Sewer Authority (HMWSA) was established in August 1965 to operate and maintain a water system to provide domestic water in the Harvest-Monrovia area of Madison County, located near Huntsville, Alabama. In the early years, the utility serviced only 700 customers. As a result of growth in the area, the HMWSA now serves a population of 42,000 inhabitants through 15,000 water meters. A rapidly growing water/wastewater utility is able to retain its existing SCADA and communications network investment while improving the system’s performance. In less than 50 years, the system has gone from only two wells providing 1.15 million gallons of water per day to today’s demands of 12 million gallons of water per day. To provide for this increase the HMWSA has grown to include two state-of-the-art water treatment plants manned by 41 employees. Although the staff has grown exponentially from the original two-person workforce, it’s still a relatively small number of personnel to cover the main plants and the numerous remote sites. In July 2011, the two million gallon a day membrane package water treatment plant and the 10 million gallon a day water treatment plant were awarded the Best Operated Plant Award by the Alabama Water Pollution Control Association. That same year, the Alabama Water Pollution Control Association also recognized the HMWSA’s three wastewater treatment plants for excellence in operation. In addition, the Authority was awarded the Best Operated Distribution System in the 5,001-15,000 water meter category in the State of Alabama by the Association. In 2002, the Authority’s board of directors decided it was time for the HMWSA to start providing sewer services to additional locations in the Harvest-Monrovia service area. As a result, the Authority built two new wastewater treatment plants to handle the expansion. This greatly increased the capacity of the wastewater treatment operations, which had previously consisted of two small treatment plants. The four wastewater plants have a total capacity of 850,000 gallons per day. The Authority also administers sand filter-style treatment plants in 20 subdivisions. Overall, the water/wastewater system is currently comprised of 44 remote sites, with plenty of bandwidth to add more sites for this rapidly growing area. The lift stations and sand filters are spread out over a large area and must be monitored closely to avoid system disruptions or spills, but the HMWSA only has a small maintenance crew of two to three people. This state of affairs created a need for a Supervisory Control and Data Acquisition (SCADA) system that could economically supervise the lift stations and other remote sites, so maintenance staff could be notified of an issue before a problem escalated. To improve the monitoring and control of remote sites in its wastewater system, the Authority purchased and implemented a SCADA system from a major automation supplier. Unfortunately, the SCADA system wouldn’t function as required with the existing remote terminal units (RTUs), despite the fact that the RTUs had been previously purchased from the SCADA system supplier. After a few years and a lot of expense, the HWMSA was only able to get three sites online, and the data supplied to the SCADA system from the RTUS wasn’t meeting the needs of the utility. The Authority didn’t want to replace its new SCADA system, and it needed to find another solution to improve operations, all while minimizing costs. At this point, our company, RTUdirect, was approached by HMWSA. RTUdirect provides automation products, services and systems to a wide range of clients in the water/wastewater and other industries. We studied the existing system, and then suggested a retrofit that would build upon the existing SCADA and network systems. The existing SCADA system uses canopy-style Ethernet radios to create a wide area network. This type of communications system is often used to provide wireless Ethernet connectivity and Internet service to communities in difficult-to-access and rural areas. We initially discovered that although the RTUs came from the SCADA manufacturer, they couldn’t communicate with the SCADA system in the manner required by the utility. The problem was that the RTUs were communicating with the central SCADA system via a polling-based with exception reporting format. Polling-based systems don’t require a lot of bandwidth, but they also can’t provide the real-time data needed for a SCADA system to provide accurate and timely data. With these polling-based RTUs, the central SCADA system polls each remote site once every 30 minutes. If an alarm or event occurs at a remote site, such as a pump coming on, the RTU will update the central SCADA system with an exception report, but this procedure lacks the immediacy of real-time data reporting required by the utility. Due to these and other limitations, after two years the SCADA system had only eight RTUs connected with essentially no real-time monitoring or alarming capability. Our company demonstrated a solution to the utility via a pilot project. For the project, we created an RTU using an AutomationDirect (www.automationdirect.com) DirectLOGIC DL-06 PLC and associated I/O with an ECOM Ethernet module. The Ethernet module was then connected to the existing wireless Ethernet network, providing a high-speed and reliable wireless Ethernet SCADA/RTU communication system. This solution provided a low cost method for acquiring data from a remote site, transmitting and receiving data from the central SCADA system, and controlling components and equipment at the remote site—all in near real-time as required by the utility. After the successful pilot project demonstration, the decision was made by the HMWSA to replace the existing RTUs with the new RTUs. 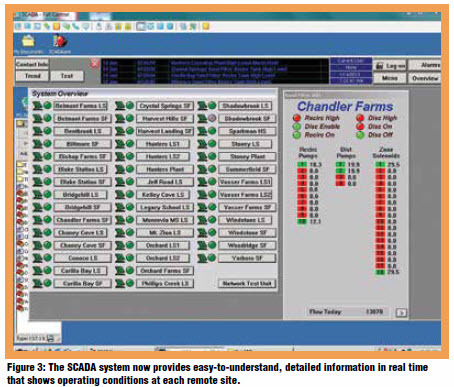 In addition to replacing the RTUs, the HMWSA also had a variety of existing control panels from different manufacturers that needed to be integrated into the SCADA system from various remote sites. A decision was made to use the same DL-06 PLC/ECOM solution. Although the DL-06 has a small footprint, in some instances we couldn’t fit it into existing spaces in panels already installed at the remote sites. In these instances, we installed the PLC in a small fiberglass cabinet next to an existing panel, and wired the new PLC to existing controllers and components. The data could then be delivered in a uniform format to the SCADA system. During the retrofit, the Authority received approval to add new remote sites, which were each supplied with the new-design RTU, which maintained consistency with the RTU retrofits (See figure 2). In order to cover the entire water/wastewater system, we improved the canopy Ethernet system by installing a few towers with radios at key locations to complement radios already mounted on water tanks. We then reconfigured communication paths to improve network performance, and to make it easier to add new sites. The HMWSA now has 44 sites online, with the capacity to add many more. The speed of the wireless canopy Ethernet network enables a real-time display of conditions in the system including motor amp readings, water pressure, dissolved oxygen levels and other variables (Table 1). In addition, the SCADA system can be used to issue commands to the remote sites, controlling equipment as required to deal with issues and optimize operations. After the retrofits and upgrades, a previously mismatched system became standardized and capable of providing important real-time data for monitoring and control such as number of starts, run time and other important operating information. The current SCADA system is an invaluable asset for system managers to diagnose and adjust processes to achieve peak performance. The essential information needed for system maintenance and repair is now displayed in real-time. If there’s a high level at a lift station, the SCADA system immediately receives this information, allowing operators to take action to correct the problem before a spill occurs. Moreover, the SCADA system not only alerts the Authority of existing and imminent issues, it also allows qualified staff to spot problems before they occur and perform proactive maintenance. The system’s trending and analysis capabilities make it easy for operators to see where improvements in efficiencies can be made, and to improve overall operations. In-depth analysis of data and operating condition has also helped the Authority make better budget decisions for new equipment purchases, obviating the need to purchase and warehouse certain items of new equipment. In addition to the PLCs, associated I/O and Ethernet modules, we supplied a variety of other AutomationDirect components for various Authority projects such as relays, terminal blocks, selector switches, indicator lights, amp sensors, transducers, and more. We chose AutomationDirect products because we knew we’d get quality, affordable solutions that were well suited for this project. When all of the projects were completed, we had used the DL-06 PLC as a retrofit RTU, a new RTU, and as an addition to existing relay-based control panels for remote monitoring and control. In each case, the PLC provided a uniform I/O and register structure common to all the remote sites, greatly simplifying SCADA system expansion. Because the HMWSA had already spent a considerable sum on its SCADA system, funds were limited to make the required upgrades and improvements. By making extensive use of AutomationDirect components and by taking other actions to provide a low cost solution, we were able to stay within the Authority’s limited budget, while still meeting their stringent performance and safety requirements. By upgrading the canopy Ethernet system to provide the communications backbone of the system, and by replacing polled-based RTUs with new RTUs with improved communications capabilities, the HMWSA is now able to monitor even analog values in real time, all without having to spend a fortune replacing the existing SCADA and communications infrastructure. Furthermore, the retrofit and the new automation systems significantly improved the system by providing a real-time clock, high-speed and reliable Ethernet connectivity, and trending information that can be used to plan for improvements. Most importantly, the retrofitted and new automation systems help the HMWSA provide better service to its customers. Do-more H2 or Do-more T1H: How to choose →← What a Drag!